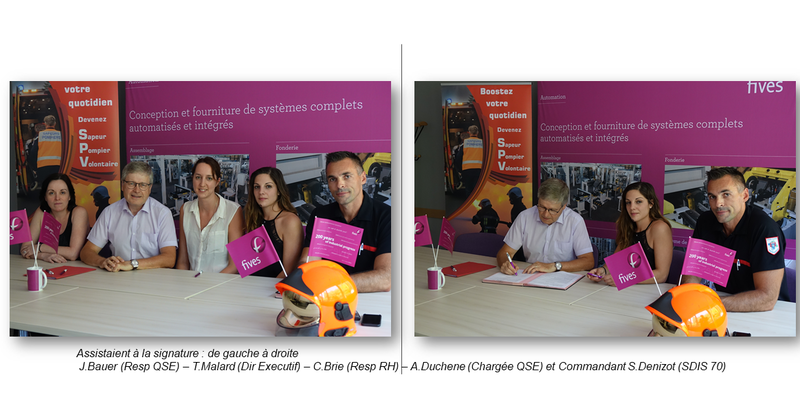 On Tuesday, August 21, 2018, Fives Cinetic signed an agreement with the County Fire and Rescue Service to facilitate the action of volunteer firefighters during working hours. Amandine Duchene, in charge of health, safety and the environment at Fives Cinetic in Héricourt, is concerned for this agreement. In Haute Saone, out of 1800 firefighters, 1700 are volunteers. “Their availability depends on their day work and the commitment of their company. Signing this type of agreement is a major civic gesture!” underlines Stéphane Denizot, commander who came to the premises of Fives Cinetic for signing. Indeed, by hosting a volunteer firefighter in its company, Fives participates in the continuity and quality of local rescue and position itself as a solidarity actor involved in local life. Health, Safety and the Environment are at the heart of Fives' social responsibility policy. By signing this agreement, Thierry Malard, Executive Director of Fives Cinetic, wants to strengthen the Group's security ambitions.